One of the most confusing aspects for many of our customers as it relates the ULC fire alarm monitoring and ULC fire sprinkler monitoring services we provide relates to the requirements for inspection. We’ve covered the requirements for inspections of ULC fire alarm monitoring and ULC fire sprinkler monitoring so that these systems comply with ULC-S561 in previous posts. The short version is that for systems to comply with ULC-S561, ULC fire alarm monitoring systems must have an annual inspection done of the monitoring transmitter. To comply with ULC-S561, ULC fire sprinkler systems must have an annual inspection done on the monitoring transmitter plus bi monthly inspections of the connections at the connections to the flow, pressure and supervisory switches of the sprinkler system. Do ULC Fire Alarm Monitoring Inspections Replace the Inspections I already have in place? These questions can be altered if we’re discussing ULC fire sprinkler monitoring, but the sentiment is the same. Are those “other” fire inspections still required if we need to do inspections for ULC fire alarm monitoring and ULC fire sprinkler monitoring? The answer to these questions is: Yes! You need to do both. The reason you need both types of inspections is that ULC fire alarm monitoring inspections and ULC fire sprinkler monitoring inspections cover only the monitoring aspects of the fire safety systems in your building. These inspections only look at the equipment used to perform monitoring that meets ULC-S561, and do not look at the overall fire alarm or fire sprinkler system in your building. 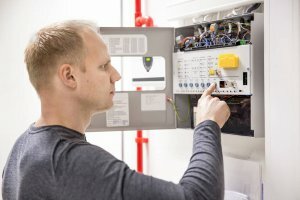 While on site for a ULC fire alarm monitoring inspection, or fire sprinkler inspection, FMC’s technicians will check the connections between the ULC fire alarm monitoring transmitter and the fire alarm panel. They’ll check other items, such as the health of the battery, transmission times and more. During ULc fire sprinkler inspections or ULC fire alarm monitoring inspections, we will not test smoke or heat detectors on site, manual pull stations, sprinkler heads or any other component of the larger fire safety systems. ULC fire alarm monitoring and ULC fire sprinkler alarm monitoring inspections are designed to ensure the proper operation of the equipment used to perform monitoring that meets ULC-S561. You will still need to contract a fire alarm company or a fire sprinkler company to perform inspections of the larger fire safety systems on your building to ensure those systems are operating properly, and comply with Building Code and Fire Code Standards. We hope this clears up a common question we get are inspections for ULC fire alarm monitoring systems and ULC fire sprinkler monitoring systems. Please feel free to contact us if you have any more questions!